Lancers free is the first Portuguese alcohol-free wine. Launched in 1944, the brand Lancers has been, since then, a case-study for success in the José Maria da Fonseca portfolio. The visit of Henry Behar, an American, to José Maria da Fonseca, prior to the Second World War end, and his idea of launching a rosé wine in the United States, became in fact, the absolute turning point of the company’s business. Lancers distribution throughout the north-American market allowed half a million cases to be sold the mid sixties. Lancers sales soared remarkably, reaching 1 million cases in the late 70s. Since the beginning Lancers image has represented an appealing, easy-to-drink product, with a readable name (the wine was christened “Lancers” in homage to one of Mr. Behar’s favorite paintings: “Las Lanzas” by Velázquez), versatile with every type of food, accessible to young generations of north-American’ consumers, meeting all the requirements of a wide range drinking moments. Aware consumers’ new concerns and trends, and with the purpose of creating more consumption situations, José Maria da Fonseca decided to launch a new Lancers Rosé Free. It is an alcohol-free wine (due to dealcoholization physical process), aimed at wine lovers who, for whatever reason, prefer to drink a non-alcoholic wine. Red grapes are fermented as white grapes for rosé at 16ºC. After fermentation takes place, the wine is dealcoholized due to dealcoholization physical process (Spinning cone). Serve on its own or with any kind of food. Lancers goes very well with salads, chicken dishes, Italian and Mexican food. It should be served well chilled at a temperature of 5ºC. 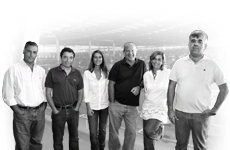 Domingos Soares Franco, winemaker and vice-president, is the youngest of the two representatives of the sixth generation of the family that manages José Maria da Fonseca. He studied in Davis, California, and started working at José Maria da Fonseca in the 1980s. Since then, he has introduced several changes into the wines produced by this company, becoming one of the most innovative new-generation enologists in Portugal. As a winemaker, his first major influence was undoubtedly that of his father Fernando Soares Franco. His uncle, António Porto Soares Franco, a man of great vision, also influences him tremendously. Among other important achievements, he deserves to be recognized as the creator of Lancers, one of the best known Portuguese wines around the world and José Maria da Fonseca’s first international "best seller".